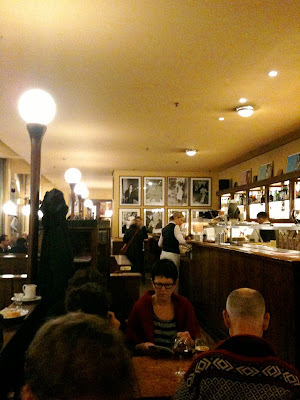 Cafe Einstein is a Berlin institution. The original branch in the heart of Christopher Isherwood's Schoeneberg near Nollendorf Platz is a lovely place to while away a few hours. It's in an historic villa with all the grandeur of a country house. The Unter den Linden branch in Berlin's Mitte area can't really compete in terms of atmosphere but the menu is basically the same. The original Kurfurstenstrasse branch has gone down in Afternoon Tea Total family folklore ever since I took my parents there and Coffee Boy decided to order an afternoon treat called a Kaiserschmarrn. We waited and waited but although my cheesecake and my parents' apple strudels arrived there was no sign of the Kaiserschmarrn. Eventually, after about 25 minutes, up came the waiter with a huge tray of freshly cooked dessert. It resembled a dish of bread and butter pudding only with plums baked within – but when I say dish, I mean dish, like the kind of dish you cook in the oven, with enough food for about four people. Never one to shy away from a challenge, Coffee Boy ploughed in and made a pretty good job of eating it up. But we've never dared order it since. This time I met friends in the Unter den Linden branch. Far more utilitarian in feel, and always packed, it doesn't have the same charm as the original but it is considerably nearer to all of our homes and for that reason is worth a visit. None of us had had lunch so we started of by each having a sandwich, a couple of us chose gravadlax and the others rocket and parmesan. To be honest I found them a bit odd. The bread was of the very pappy white sliced variety without crusts. The rocket and parmesan bread was toasted and seemed to go down fairly well; the gravadlax came on the plain old bread and was somewhat disappointing. But I was prepared to let it slide if the cakes would live up to my memory of them. Usually, as you know, I would go for a lovely cup of tea, but this was an exceptionally cold day and the lure of Cafe Einstein's hot chocolate proved too much to bear. 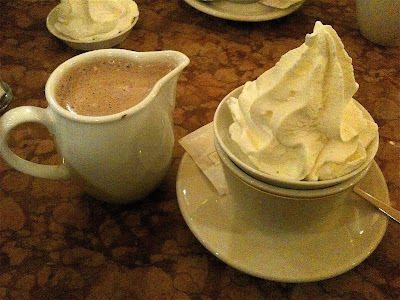 It comes served in a little jug and the accompanying cup has a lid covered in a swirl of whipped cream. The jug contains enough for two cups so prepared to be buzzing by the end of it. But just to be sure we decided to order a selection of sweet things. I, as is so often the case, couldn't refuse the Sachertorte; another of us went for the cheesecake; and two others chose the apple studel. If the sandwiches had been a disappointment, the cakes were anything but. My Sachertorte was rich and moist with a nice substantial layer of apricot preserve. Unlike most others the chocolate coating was a hard shell that cracked as you cut into it – unusual but very good, although apparently that is the way the original was served. (Sorry for the lack of picture, and the general quality of the photos. I forgot my camera on this trip and my iPhone camera didn't cope well in the low light). 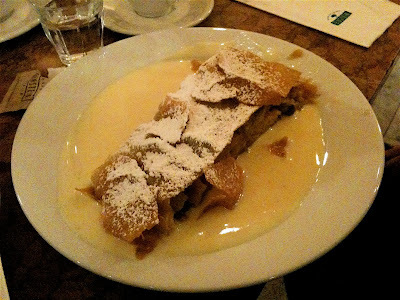 The cheesecake was equally tasty and the apple strudels weren't bad either. They came served warm with vanilla sauce – a sort of runny custard – and although not as big as the Kaiserschmarrn, they were no light snack. 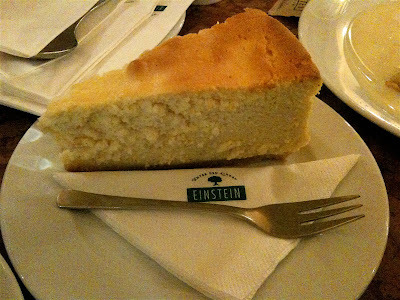 Cafe Einstein is not a cheap place, our sandwiches, cakes and a couple of drinks for four clocked in at €75 including tip, but it is worth visiting. 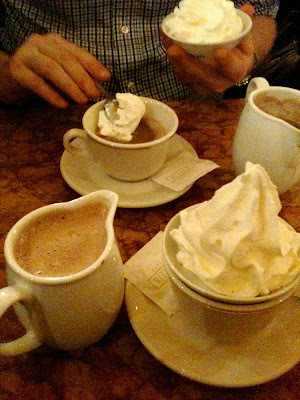 The sandwiches were certainly no great shakes but the sweet offerings, and especially the hot chocolate, are pretty special. Even though this Mitte branch isn't in the same league as the Schoeneberg location looks-wise, when you find yourself on the windy expanses of Unter den Linden in need of refreshment it's well worth popping in. But be prepared to wait and then battle for a table, this is not a town that takes it kaffee and kuchen lightly. I'm sorry Marlena. I just can't help myself! If you do make a Sachertorte please send me some photos. I'm not sure I would ever dare attempt such a feat. Oh no! Sorry if I freaked you out. I think I saw in Liberty London Girl's comments that you used to like Teenage Fanclub, and that you write about cake and live in Berlin, so I followed you. ;p Love Berlin. 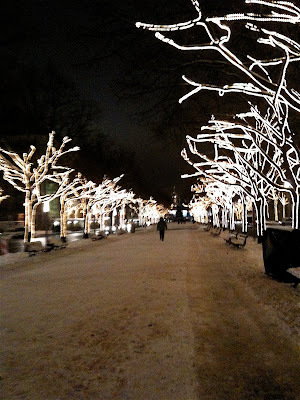 Where did you go for NYE? Yummm, oh my gosh those all look amazing. Why do I have to be on this stupid "get in shape for my wedding" diet. BOO! Now come on JMay, a little bit of cake won't do any harm! (Although maybe don't have portions as big as these German ones...) From bitter experience I'd say don't go crazy on the wedding diet - everyone that will be there knows and loves you as you are. Shifting a few pounds probably won't make you any happier on the day and massively adds to the stress in the lead up. Hope you have an amazing day either way.